Invasion of the Michelin-starred Chefs! 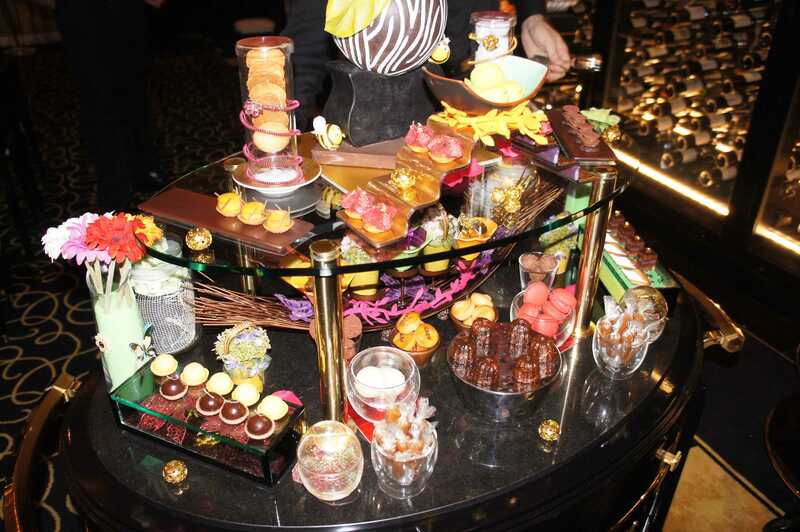 Joël Robuchon is one of most starred Michelin Chef, and when his fine dining restaurant is accorded with the usual 3 Stars, it is a visit that you must detour to get to. Having dined at his restaurant in Paris, we decided to see how much it defers from the local one at RWS. 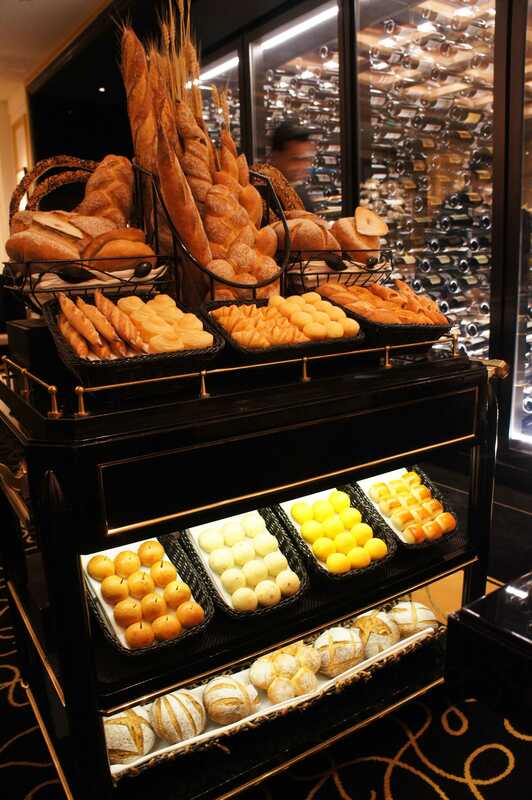 The Robuchon bread trolley is legendary. And for that evening it was impressive selection of bit pieces of all kinds of bread. My wife commented that this is the best bread she has tasted so far in Singapore. Her taste is more tuned to the Japanese style of baking where the flour is milled to a finer grade that French bread making. The Bread Chef Tauchi-san hails from Japan. I suspect he has included that Japanese touch using French techniques – the best of both world. We tried all the different ones and loved the bread milk (square ones on the second row first from the right), but everyone was so good that its a meal on its own. Coupled with French butter and sea salt, we ate so much that we have to force ourselves to stop as the food was not even served. The dinner started with a teaser course of a pannacotta with almond and baby cherry tomatoes. Where did they get those tiny tomatoes? Well balanced course to wet the appetite. Next the appetizers. 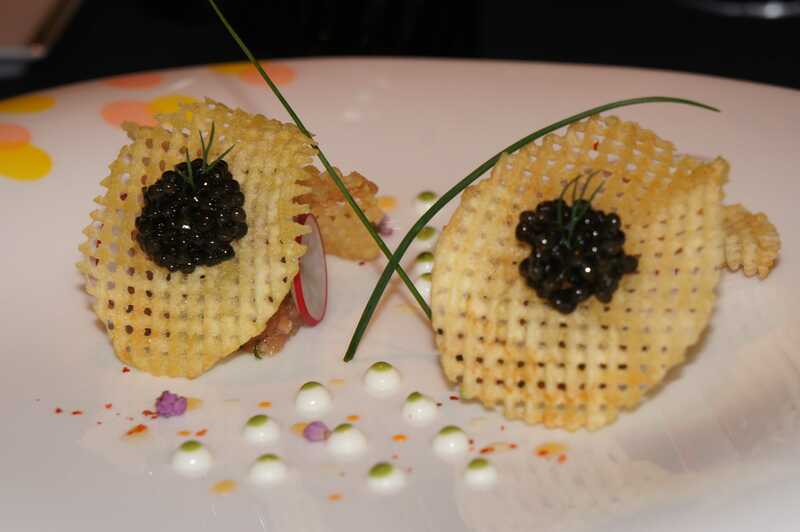 Le Saumon when “translated” to proper English is “Smoked salmon “frivolity” with caviar and potato waffle”. The photo is a close-up. The actual size of this dish was about the size of the a potato chip you get from the supermarket. Hidden behind the chip (which is not the supermarket variety, it’s handmade) is a salmon tartare, very well flavoured and delicately balanced with tiny droplets of sauce on the side (the triangle of white spots with green dots). The only way to appreciate this dish is to treat it like an art piece. Tasty, but really the portion is too small. 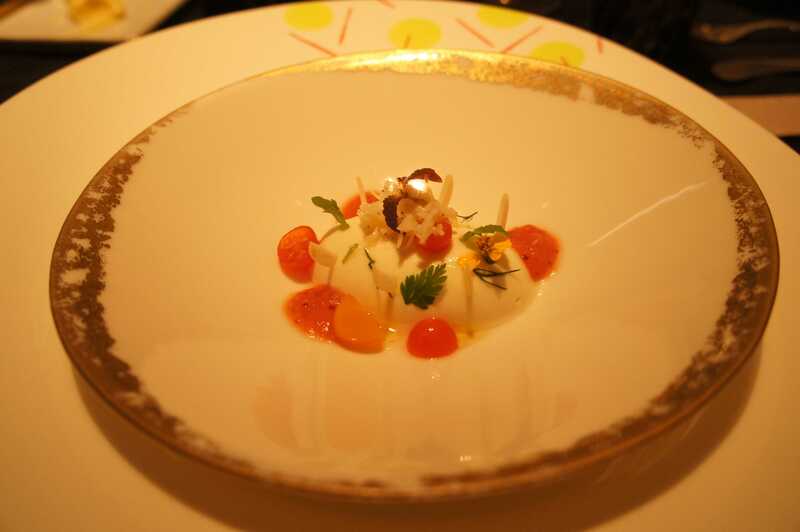 The Mille Feuille or “Mille Feuille with crab, herbs and tomatoes on a tomato gel” was a piece de resistance among the appetizers. 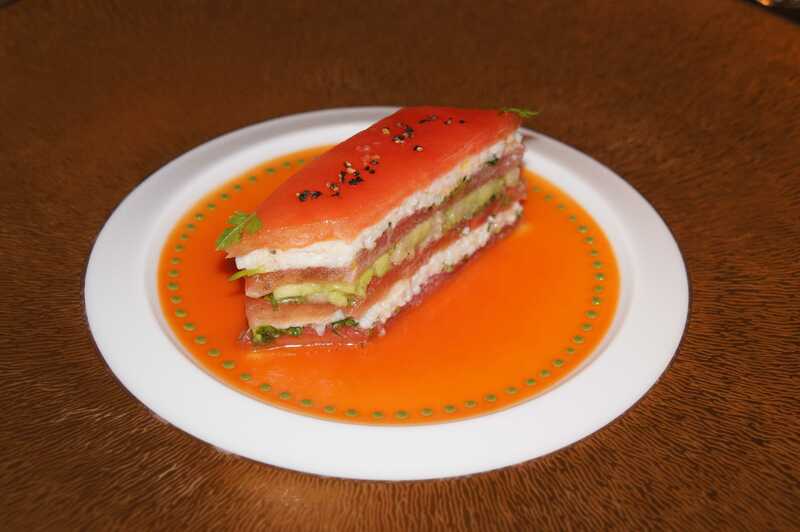 Built as a mille feuille (a tradition pastry with 3 layers and 2 layers of fillings), the fillings were filled in between layers of tomatoes. And the filings were crab, baby zuchinni, cream cheese which blends very well with the gelee on the plate. All 3 of us were fighting over this dish. This is not offered previously, but was available that evening. I guessed we were very lucky. The next course – les soupes. 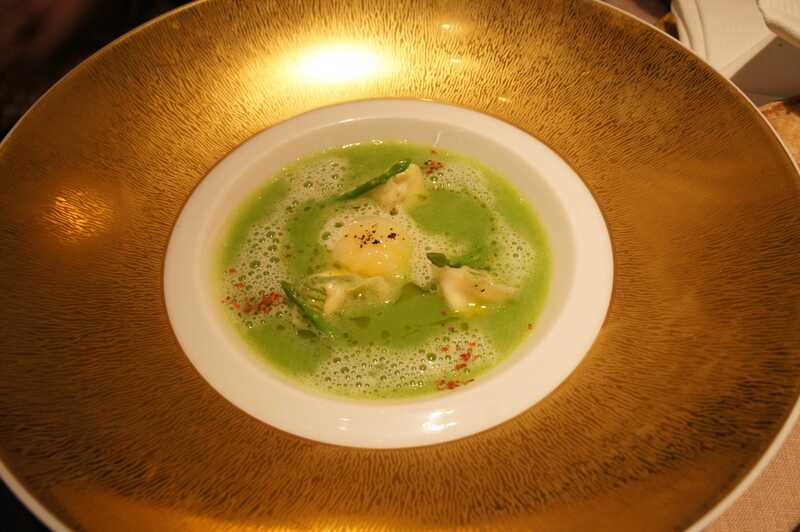 Les Petit Pois or “Light green pea velouté, refreshed with peppermint on a sweet onion cloud” was exactly as it sounded – pea soup on a cloud, fluffy and full of air. 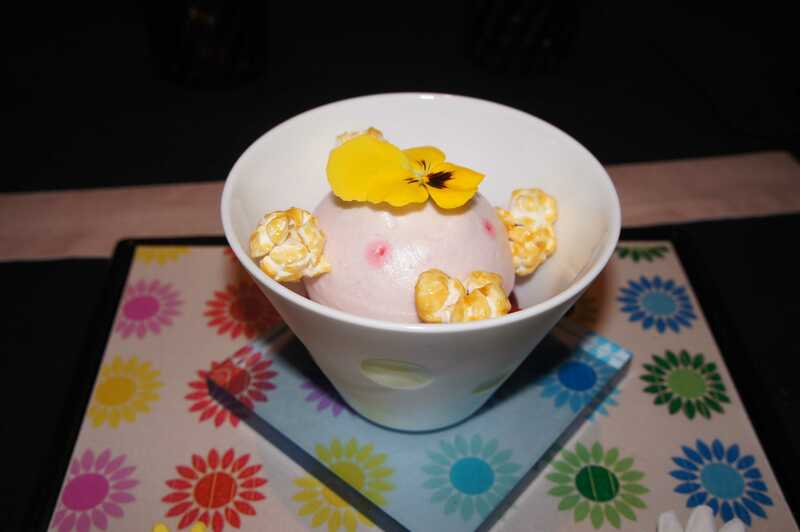 It looked like molecular cuisine made famous by another very famous Michelin chef – cloud of sweet onion? Didn’t get what the Chef was trying to achieve with this soup. The other soup L’Asperge or “Broth of wild asparagus, ricotta and parmesan cheese with soft boiled egg” was a success. We never imagined that asparagus can be treated in this manner and blended with an egg. The cheese added a different dimension to the complexity of this soup. While the techniques for both soups are a class way above many restaurants in Singapore, this soup came across better. The main courses followed. Le Canard or “Duck and seared foie gras with cherries and almond” brought us back to the traditional French techniques. 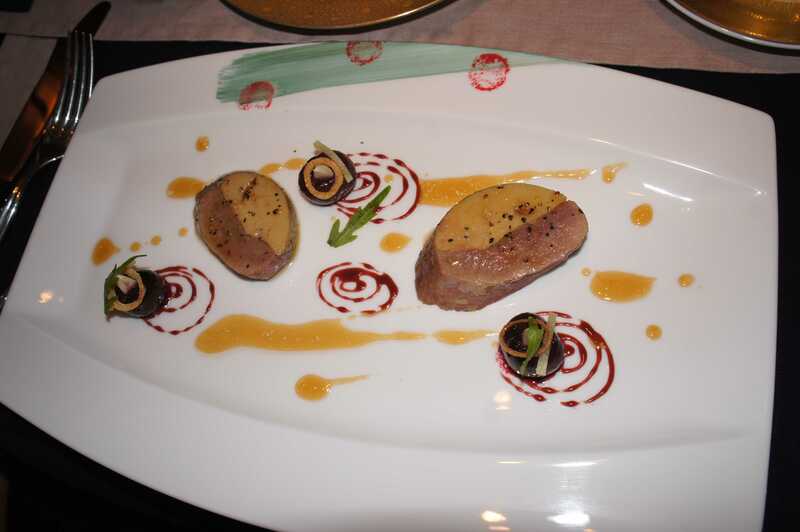 The duck breast was combined with the foie gras, while the duck was moist and perfectly done, the foie gras maintained the seared texture. Very good dish but again the size of the 2 pieces of meat were about the size of your Apple Mighty Mouse. L’Agneau or “Lamb in a Mediterranean vegetable torta, granited cannelloni flavored with tandoori, sauteed chop with thyme” was a dish with lamb cooked in 3 styles. First is the straight forward lamb chops seared and served au jus. 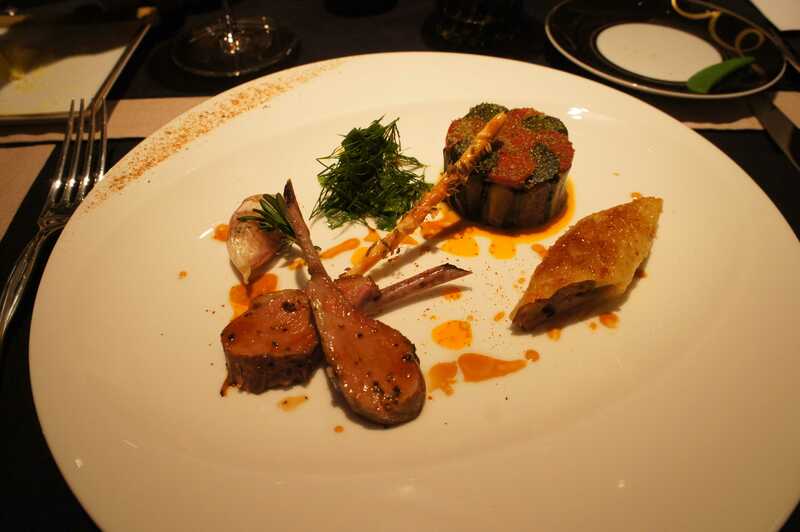 The cannelloni featured a filling of chopped lamb seasoned in tandoori style. The pastry was surprisingly fluffy even when contents were quite moist. The torta was filled with minced lamb with tomato done in an Italian style. For me, the grilled garlic was a great addition to the dish. 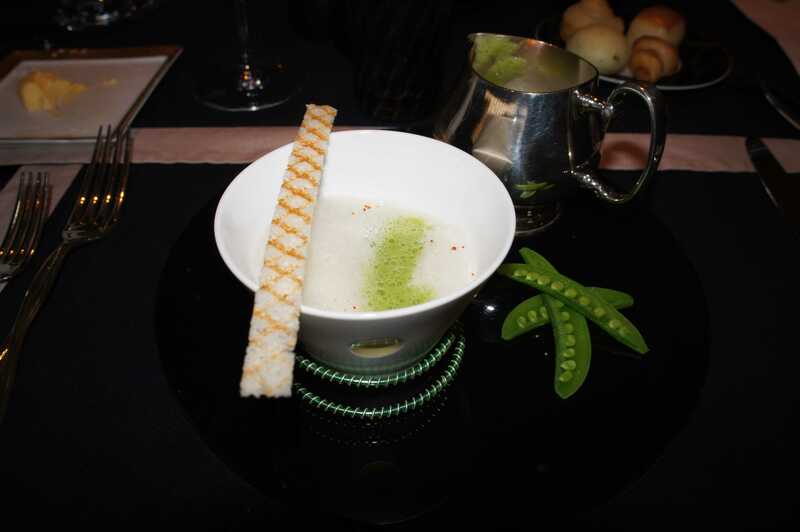 And after the dish, you were given a cup of vegetable consomme to wash all the lamb taste away (which there was none – the lamb taste I mean). 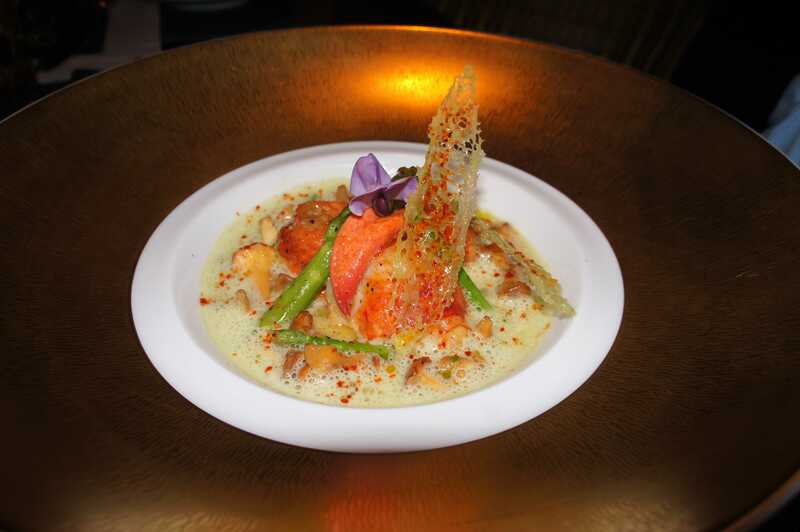 Le Homard or “Caramelized lobster in salted butter, green asparagus with Chateau Chalon” was a kid-friendly dish. The lobster cooked to perfection in a butter cream sauce with asparagus. Again, it is done a French cooking style with a cream sauce. Le Beouf or “Beef ribeye, wasabi spinach and a medley of bell peppers” was upgraded for a Wagyu-version but seriously this was the worst dish for the evening. 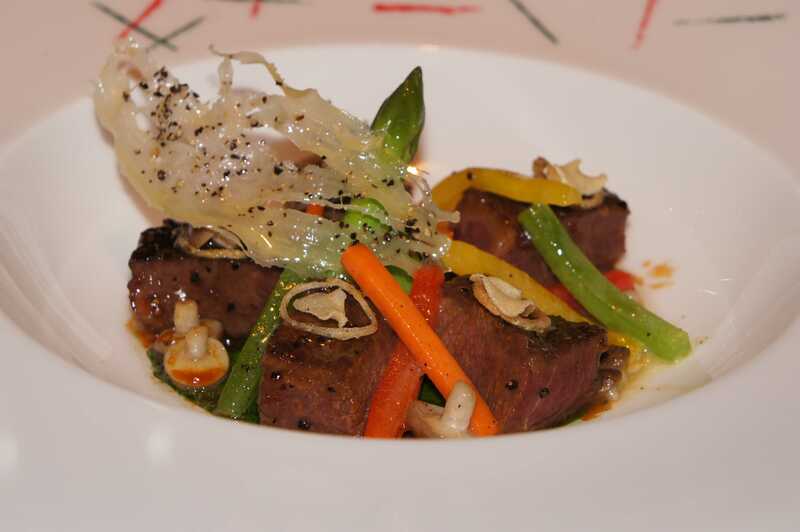 The dish was done more of a Japanese style steak then a traditional French style. And the Wagyu was not really a top-grade one (and I suspect not the Japanese variety). Not worth the $45 upgrade. In fact, skip this dish altogether. With the main courses out of the way, we moved on to the final part of the dinner. As with all good French dinner, you get a fantastic selection of cheeses. 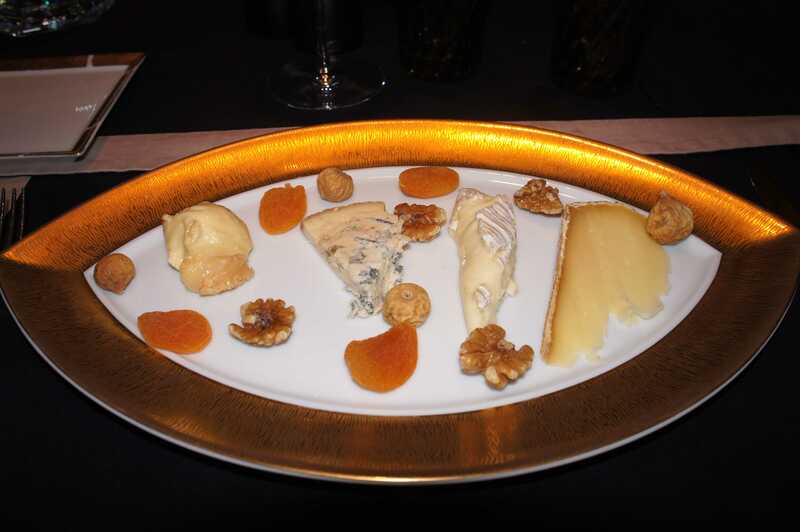 From right to left, in order of the strength of the taste were Tomme D’Savoie, Brie, Form D’Ambert and Epoisse. Just to qualify, I am not a cheese expert, and like wine I went for taste more than pedegree or variety. I don’t like chalky cheese (hard cheese) or the American cheddar type. I like the types that you can spread like butter. So the choices were all soft cheeses. Tomme D’Savoie was a beginner choice – not much of a smell or overpowering taste. Brie was slightly saltier and spreadable but still an entry-level choice. Next came the blue cheese varieties. Form D’Ambert tasted like pungent tofu and the Epoisse tasted like Chinese salted fish. and smell like one too. I have to comment the sweets together because it all came to a blur of ultimate sugar indulgence. 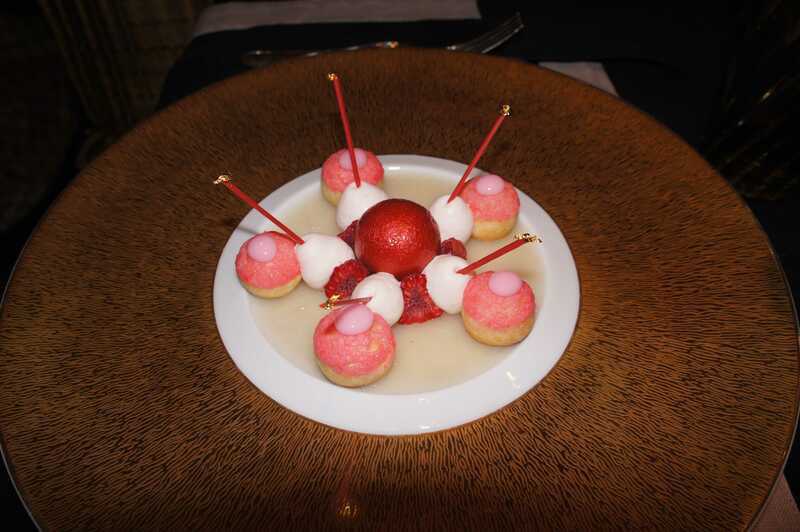 Among the sweets Le Choux Pricesses stood out as the best we had. 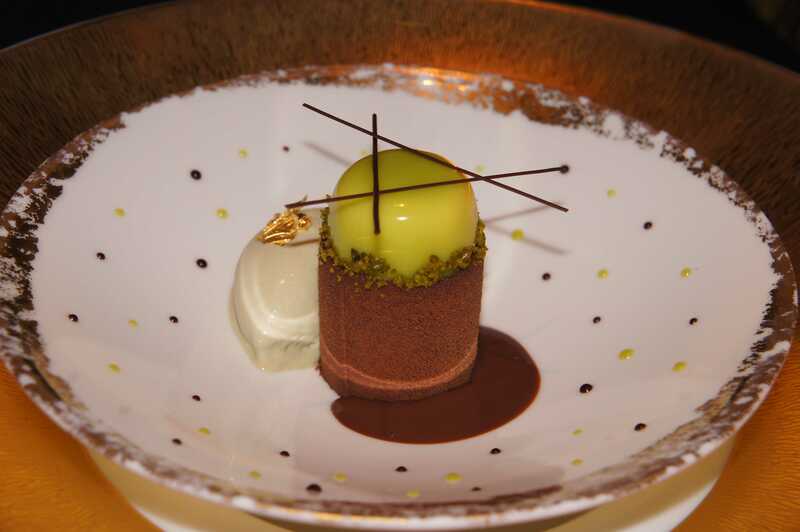 The technique was the most complex, and the taste was the most layered as well. The Executive Chef is Japanese – Danzaki-san which explained the strong Japanese influence in material use and techniques like use of bonito sauce and urchin to heighten the complexity. Price: Wah LAO! Average $350 pax. Ambiance: Art Deco style with dark wood tone. Very good for dates, special occasions. Service: The front desk cocked up the reservation, we arrived without our table ready. But the rest of the staff were very attentive and knowledgeable of what the restaurant can offer. Except for one that tried too hard to explain everything that we were eating, assuming that its the first time we ate in a Michelin restaurant. Maybe that’s because we didn’t really dressed for the occasion. Mind you the rest of the guests were dressed to kill.